Chocolate Beet Cake with Ganache Frosting | Naturally. In preparation for my csa potluck, I scoured the internet (mainly foodgawker) for delicious looking desserts that I could make. I searched endlessly for cupcakes and tossed the idea of a tart back and forth but still, I couldn’t make up my mind. That is, until I remembered the video that tiger in a jar filmed of beet cakes. Come to find out, she ate a piece of this cake, loved it, went back for more, and then read the tag which appropriately was labeled, “chocolate beet cake.” At which point in time she ran and professed her hatred for beets. I absolutely love this cake. The beats add a moistness and slight bit of earthiness to the cake that is amazing. I seriously love this cake!. Of course, I couldn’t leave well enough alone and had to add the ganache. What a perfect way to usher in summer! To prep. pull butter and eggs and bring to room temperature. Also, butter and flour two 8″ cake pans. 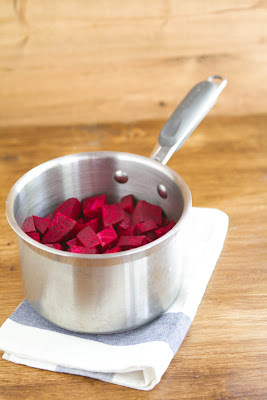 First, peel the beets, cut into small pieces and cover with water (just enough that the beets are barely covered) and cook until beets are tender (30-40 minutes). If you have a lot of excess water left, drain so that only 1/2 cup remains with the beets. Puree beets in a blender until no large chunks are left. Set aside to cool. While beats are cooking, combine 1/4 cup of the butter with the ounce of chocolate. Melt and whisk the chocolate and butter together. Set aside to cool slightly. In either a large bowl or your stand-mixer bowl, combine remaining softened butter and sucanat, beating with a paddle until well combined. Next, beat in eggs and vanilla until the mixture comes together, scrapping down the sides of the bowl as needed. Add in melted chocolate/butter and beet puree and continue to beat. Sift together the dry ingredients and add to the batter, beating until everything is well combined. Pour evenly into cake pans and bake for 25-35 minutes (a toothpick should come out clean when the cake is checked.) Set aside for 10 minutes, then loosen both cakes around the edges and flip onto pieces of parchment to let cool. To assemble the cake (once the cakes and ganache are cooled), take one cake and place on your serving plate. The cake is really moist and you may have to take a knife to loosen the cake from the parchment paper. 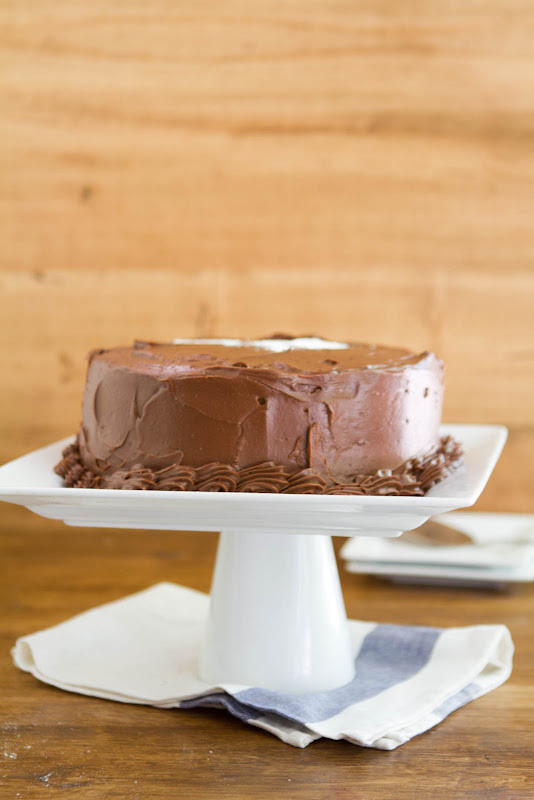 Cover the first cake with 1/2″ layer of ganache and place the second cake on top. From here, take a healthy scoop of ganache and crumb coat the cake with a thin layer. 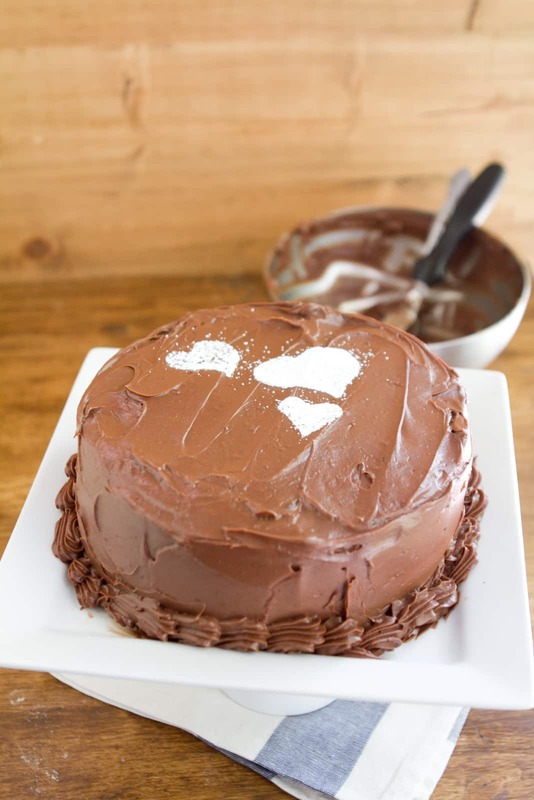 Place in refrigerator for 15 minutes, remove, and cover cake with remaining ganache. Keep in refrigerator until ready to serve! That’s adorable! 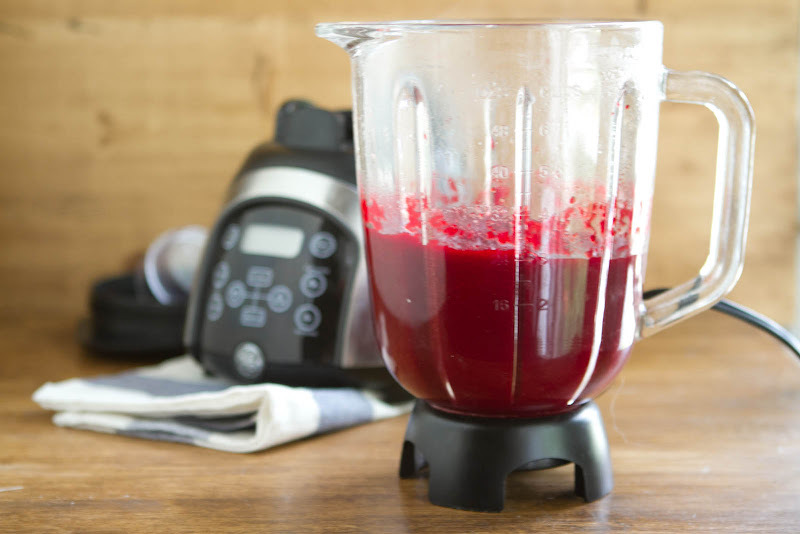 I hate beets too but I’m definitely going to try this recipe!! That is so pretty, I love the way you decorated it! I love the hearts—adorable! I wish I could see the inside of the cake. Do the beets give it a natural red hue? Once the cake bakes, the chocolate takes over the redness and it ends up looking like a chocolate cake. I wanted to get a photo of the inside of the cake but everyone ate it before I could! You are so creative! I would have never thought to do this. I am a little bit nervous about beets in general… not a huge beet lover, but I am so intrigued by this that I might just give it a try! Such a cute story! I love the powdered sugar hearts on top of the cake, too. Do you know I’ve never tried a beet? It’s about time to change that. I now work at a restaurant that makes raw, vegan beet gnocchi. Maybe I’ll eat it after my shift tonight! what would you do to this to make it diabetic friendly, i would love to see it in that capacity. The most moist cake I’ve ever made. Awesomely yummy and my no vegetable eating 14 year old is enjoying a piece right now! I made this today and took it to my fellow students at my university. The cake had a good flavor, but was not as moist as I expected. The last cake I made with beets in it was extremely most and dense (which is how I like my cake), so I was a little disappointed, but I would recommend the cake for its nice chocolate flavor. Hmm- this cake was very moist when I made it. The cooking time may need to be adjusted!